Only two days remain to obtain discounted registration for the 3rd Annual Seedstock Sustainable Agriculture Innovation Conference: “Reintegrating Ag: Local Food Systems and the Future of Cities”. The event, to be held Tuesday and Wednesday, November 11-12, at the UCLA Anderson School of Management, will focus on the economic, environmental and community benefits that result from the development of a robust local food infrastructure. Day 1 of the conference will be comprised of an urban farming field trip on which attendees will get a sneak peak at Los Angeles’ first multi-faceted food production business incubator for local entrepreneurs along with a tour of a blossoming 1.5-acre high school campus urban farming operation in Pasadena and a visit to a hydroponic shipping container farm in the L.A. Art District. 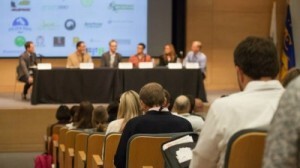 On Day 2 (Wednesday, Nov. 12, 2014) of the conference, attendees will convene at the UCLA Anderson School of Management in Los Angeles for a series of panels and breakout sessions that will address the definition, economic impact, role, long-term benefits, challenges, and solutions associated with the development of a vigorous local food system.